I did mega hours of research to find this stuff out. I think it is the most informative web page on karaoke with the information you actually need. If only Google would figure that out. A lot of the stuff the software tech support doesn't even know. Click here for the procedure to remove the Nutech multiplex, match the volume to the other brand songs like Sound Choice and to get the Nutech to work on all five speakers. 32 GB USB $29 See http://www.amazon.com/exec/obidos/ASIN/B001XURP8Q/qualitycounts. I'm guessing that it will hold about 7000 songs. Go the 64 GB if you think you'll need more than that. 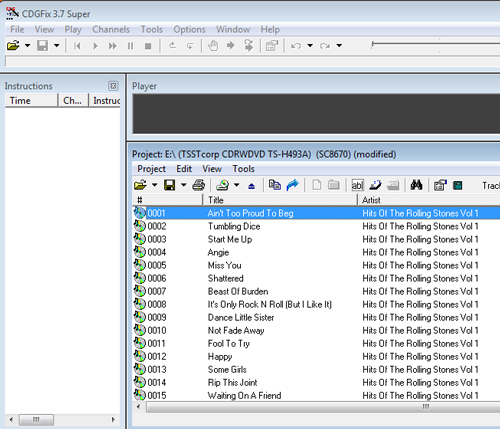 CDGFix software to convert the karaoke disc (CD+G format) to the ,mcg format on the USB. CAVS INXMenu freeware. CAVS moves the link around. Click here for an old copy I have or Google "CAVS INXMenu". It generates the english.inx file on the 32 GB flash drive. The CDGFix software will also do that but on the TV screen it only shows the song number. If you use the INXMenu software it with show both the song number and song title. A Sound Choice brand karaoke pack at ACEKaroke.com. FastTracks Songbook Creator - It makes web and hard copy songbooks. Click here for an example. Something like this might be a way to go for a cheap amp: :Lepai Tripath Class-T Hi-Fi Audio Mini Amplifier with Power Supply . You'll probably need a 1//4" to 3.5 mm adapter for the mic. I've been meaning to update this page for some time. The below info starting with "Song List:" (far below) is old information that I need to go through. However, to expedite, here is what I'd recommend for a karaoke system assuming you already have some kind of amplifier and speakers. Click here for the Nutech Party Pack in the Excel format. CAVS 203G with USB - Make sure you don't make a mistake and get the one without USB. The USB if for external hard drive or flash drive. Search the internet and find a good price. Click here for where I bought mine ($249.99 with free shipping). Again, you want the one with USB, don't make the mistake and get the one for $167.99. If you include the 3 CAVS super CDG discs (3702 songs) that I talk about below, the total comes to $369.99. I don't see any advantage to that hard drive they are selling on that page. It's waay overpriced. What I think they are saying is that it's already formatted for FAT32, which I discuss below. Yeah, it's protected but so is the 32 GB flash drive I mention and you can stick the flash drive in your pocket. Update: VocoPro DVG-777K-II Multi-Format USB/DVD/CD+G Karaoke Player - If I were going to do it again I'd probably go this route, especially with that price at Amazon.com. You'll need an external hard drive with that unless you want to go crazy changing discs. I'd get a 32 gigabyte flash at Amazon.com . It has to be formatted for FAT32 not NTFS. Vista will not format FAT32, you need XP. I think the flash drives come formatted for FAT32. If you use a regular external hard drive, which is probably formatted for NTFS and you only have Vista, your stuck. I estimate that a 32 GB flash will hold about 7000 songs. The CAVS comes with one low quality wire type microphone. I recommend the VocoPro UHF-5800 Professional 4 Channel UHF Wireless Microphone System. A cheaper option might be the PYLE PDWM5500 4 Mic VHF Wireless Microphone System, which got good reviews. The CAVS uses the .mcg format but nearly all karaoke discs are in the .cdg format. I recommend CDGFix to convert from .cdg to .mcg and transfer it to the external had drive or flash drive. On the external or flash drive, all the songs need to be in a directory named "CAVS INX". Make sure all the songs have the same number of digits, i.e., 00001 - 4264 in my case, not 1 to 4264 because you'll have problems. The CDGFix software will allow you to type in the number of digits. I used 5 which is good for 99,999 songs. For the external hard drive or flash to work, you need to generate a ENGLISH.INX file in the CAVS INX directory. For that you'll need a small .exe program called INXMenu.exe. It's available on the CAVS site but they keep moving it around. If you can't find it, I put it on my site. Click here to download it. If you want a basic library of karaoke songs, you can get the 3 disc super cdg CAVS disc usually at the same place you got the player. That's 3702 songs. You can use to CDGFix software to get those songs onto the hard drive. The CDGFix software has a bug and sometimes to need to deselect "View-Tools" (I think that's what it was) and select it again to get the bottom part which has the menus you'll need. The CAVS super cdg song discs are multiplex meaning you can select vocals or not. I'd get rid of the vocals via the CDGFix software by selecting the left or right channel (I can't remember which one, play with it), not both. See the menu in one of the pictures below. Instead of the 3 disc super cdg CAVS discs, I'd recommend Sound Choice brand karaoke discs. Go to ACEKaroke.com and search your favorite artist and go with the Sound Choice brand name. You can also go to the Sound Choice website. Take the four digit Sound Choice number and add CDG and a space (for example SCG1234 would be CDG 1234). Then search for "CDG 1234" in this fictious example on eBay. It's a lot cheaper. On the CAVS player don't go higher than 3 on the sound level or you'll have a big feedback problem. Adjust the sound level via you amplifier. Stick with 3 for the sound level on the CAVS player. For the songbook, I like FastTracks Songbook Creator. It will also create a songbook web page. Click here for mine. For what the hard copy song book looks like, click here for my songbooks in the .pdf format. Ignore the favoritefavorites.pdf one because that's just a one page spreadsheet. If you save a spreadsheet in the .csv format then go to FastTracks, there a bug. Import the file in FastTracks, then exit FastTracks which saves the file, the open FastTracks again and select that file. If you don't do that you'll have problems with the web pages generator. If you buy something at Amazon.com and use any of their links on this webpage, I get a small commission from Amazon. I'd appreciate it. Pictured at the right is my system. Any questions, email or call. Optional feedback destroyer (click here for Amazon.com price)) CDGFix software - select "Project - Load Disc"
Disc loaded/td> Select "Export Tracks"
SSelect from the menus and run. The new karaoke disc is copied to your 32 GB flash drive. If you are using those CAVS super CDG discs, play around with that MPX menu to remove the vocals. I can't remember if it's left or right. If it's a regular .cdg disc, select "Left and right channels as original". CDGFix just added the English.inx option to the newer version of their software. I'm still using the CAVS INXMenu software to generate the English.inx file. Make sure you don't select "(and rename song files)". That is dangerous. I don't even know why they put it in there. You might also want to highlight all the song files in Windows Explorer and right click and select "Properties" and make them all "Read only" in case you make a mistake. My wish list - The next time I order a custom disk, I'll add these. Nutech Party Packs Volume 1, 2 and 3 - If you do the math it only comes to 8 cents per song with very few duplicates ($100/1234)=$0.081. The problem is removing the vocal if you don't go with the CAVS brand players or ever decide to switch to a computer based system. See my notes on removing the vocals below. Earthbound Karaoke has the three volumes bundled with the CAVS 203 (with USB) at a good price. You'll have to use the CAVS players with the Nutech Super CD+G or else get CGDFix 3.4e Super and rip the Super CD+G to another format on your hard drive. buykaraokedownloads.com/a> - Great selection and price but I didn't like the quality on some. mycdg.com (top songs)) - $3 per song but if you buy CD+G disks, by the time you figure the duplicates and the fact that there are only about two good songs on a disk and the duplicates and the fact that the rest you will never play, you are probably paying a lot more than that. The hard part is determining good karaoke songs. Click here for my suggestions. Click here for my wish list. Amazon.com - They have a fair selection and good prices with no tax and free shipping. I'd get their Party Tyme Karaoke: Oldies Party Pack and their Party Tyme Karaoke Country Classics Party Pack. Karaoke Version - I don't know about this site though. It seems like every time you find a song it says it doesn't contain the lyrics so what's the point? ebay.com - If you know the specific disc you want, you can usually get a new one via ebay at a lower price. acekaraoke.com - A good selection but stay away from some of the brand x's. They can be really poor quality. CAVS/a> - You can download individual songs for $3 per song but they don't have much of a selection. DJ Deals - They had the lowest price on the VocoPro KJM-7900 Pro mixer I got (Click here for the weird wire that if required to go from this mixer to the amp). They also have the best price on the VocoPro UHF-5800 wireless 4 microphone system I've seen. Siglos Karaoke Player/Recorder (about $50) - This might be a good option for computer based karaoke. It uses Microsoft Media Center for it's display. It is also the only decent karaoke player software that I've found that has the multiplex feature to remove the vocals from the Nutech Super CD+G originated files. CompuHost Karaoke DJ Hosting Software - Has more whistles and bells than the Siglos Player but has a crappy karaoke window. CDGFix Super - This is a must if you have Nutech Super CD+G. CDRWIN - The only software that I know of that will copy CD+G to a disk. The problem is that the CD+G option to disk is only compatible with certain recorders and the ones they list are no longer in production. http://www.goldenhawk.com/cdg.txt, http://www.goldenhawk.com/faq_body.htm#cdg and http://www.plextor.com/english/index.html. Power CD+G Burner - Will copy CD+G to a disk but it is in the .cda format which is read by CompuHost's ripper but probably not by most karaoke players. FastTracks V2 Plus software - Does a great job of making song books and is required for the CompuHost software for the optional auto naming feature. I have about 4500 songs and it save me a lot of work by not having to enter the title and artist of each song manually. It also makes song book web pages. Click here to see mine. Karaoke Song List Creator - I downloaded the trial version but liked the FastTracks better. I had a big write up on this but now it's easy. It's an option with CDGFix Super. For the basic directions, see http://cavsusa.com/instruction/cavs_make_scdg.pdf but there is a lot they don't tell you. I was able to get 2000 songs on a disc in the super CD+G format with DVD DL compared with about 90 songs on a CD. PX680U is NOT cd read or write. The 800A, 810SA, 810UF are our newest, current drives. From that you would think that the Plextor PX-755SA or PX-760 are the way to go. However, all those listed are no longer in production. Everyone stopped making the CD/DVD ROMs that write CD+G. I guess there isn't much demand for them and if you have to jack up the price $20 for something nobody wants it puts them out of the price competition. I was able to get a new (unused) old model CD/DVD ROM via ebay. The guy had 14 of them and I think he sold out the same day. I specifically asked Plextor tech support what the difference was between the IDE and SATA CD/DVD ROMs and told them what kind of computer I had. They said both would work. When I received it from ebay, the wiring was completely different. I told Plextor tech support and they said that was the wrong one and I'd have to exchange it for the SATA. That burned me up because I asked that question and told them to see the question in that email. Finally I did some more research and found out that there are two options and I tried both and they worked. You can keep the IDE Plextor 760 as an internal drive and go with a Silicon Image Sil0680 UDMA/133 IDE RAID PCI Controller Card or you can make it and external drive with a Sabrent USB-DSC5 Serial ATA or IDE 2.5-/3.5-Inch to USB 2.0 Cable Converter Adapter with Power Supply. I wasted my money on a SATA to IDE adapter that didn't work. I preferred the external and now have three CD/DVD ROM (2 internal and 1 external) on my Dell XPS. CAVS says the SATA version won't work anyway so maybe my mistake in buying the IDE instead of the SATA was really luck. So you can see all the problems you run into. I was thinking I should write a book on it. Some guy wrote to me and said he wrote a book on vitamin D mostly from my vitamin D web page. If you follow the directions on making your own super CD+G at http://cavsusa.com/instruction/cavs_make_scdg.pdf, there is a lot they don't tell you. Before you generate the CAVS MCG/.dat files put the curser on the just past the last letter in the last line of the SCDG.CFG file and hold the delete key to ensure there are no blank spaces. Which software to use had me confused. To write CD+G to a CD or DVD everything says that CDRWIN is the only software that will do it. However super CD+G is some kind of ultra zipped form of CD+G. You need a special CD+G capable CD/DVD ROM to write CD+G. CAVS even says that you still need those same special CD/DVD ROMs to write super CD+G. So you would think that you would still need the special CDRWIN software. I tried the built in Windows software and the Roxio software to burn the files to the DVDs and it didn't work so that kind of confirmed that theory. So then I tried the CDRWIN software and it worked for a two song super CD+G file so that seemed to further confirm that theory but when I tried larger files it would always crash and corrupt the disc. Then it seemed like everyone in the forums were using the Nero software so I tried that and everything worked great. Those idiots at tech support either don't answer or tell you something completely wrong. With Nero, you select Nero Express (not Nero Startup) and Data and DVD (not CD) and follow the menus. To get the the CAVS_MCG folder to the Nero window was to bring up Windows Explorer and right click the folder and select "Copy" and then go to the Nero window and right click and select "Paste". CyberPower CPH720P USB Hub, 7-Port, USB 2.0, 480Mbps, 1.1/2.0 Compatible, PC/MAC PlugNPlay - Your are probably going to need more USB ports. Power Sentry 5-Outlet PowerSquid Surge Suppressor - You'll probably need more outlets. Cables To Go - 40323 - 5M (16.4ft) Velocity HDMI to DVI Digital Video Cable (Blue) - Makes you HDTV a computer monitor. You may have turn off your computer, unplug the monitors, turn on your HDTV and select HDMI, plug the cable into the computer and HDTV and turn the computer on again. Cables Unlimited Premium 12-inch DVI-D Cable Splitter - This might work instead of doing the above hassle but I couldn't get it to work with my Dell. Cables To Go - 03179 - 3.5mm Stereo Male To 2 RCA Female Y-Cable (Black) - This might be a better option than above because it will connect regular RCA stereo cables which you can buy in just about any length. Cables To Go - 40645 - 3.5mm Stereo Male To 2X RCA Female Adapter - Even cheaper option than above. Monster Ca Mnstr Stndrd 16' THX Cert. Fib ( 126034 ) - Better quality audio than the analog cable above but most mixers don't have and input for it. Logitech Cordless Desktop LX 710 Laser - Great for using your HDTV as a computer monitor. Tripp Lite U026-016 USB 2.0 Active Extension Cable (16 ft.) - To extend sensor for wireless keyboard and mouse to your HDTV. DVI TO 3 Component HDTV Adapter - This might work if your TV doesn't have a HDMI connection in which case you can't use the 5M (16.4ft) Velocity HDMI to DVI Digital Video Cable above. Monster Cable THX V100 CV-16 Component Video Cable - required for above adapter. CGDFix 3.4e Super - For making backup super CD+G and converting super CD+G to regular CD+G. I haven't found any karaoke DJ software that would read super CD+G except the one made by CAVS itself, which was junk. Belkin F3U133-16 USB 2.0 A/B Cable (16 Feet) - Might need this USB cable extension if you went with the CAVS DVD-203G USB route. CompuHost Karaoke DJ Hosting Software - I looked at a lot of software options and liked this the best. Plastic Comb Binding Machine - For binding your by-title and by artist karaoke song books. CAVS DVD-203G USB - If you go with the player based route vice the computer, the have a great price bundled with the three super CD+G CAVS volumes (3700 songs) or unbundled. Nutech volume 1,2 and 3 (super CD+G) - Good price on this if you don't go for it bundled with the CAVS DVD-203G USB. VocoPro UHF-5800 - DJDeals.com. Good price on 4 microphone wireless system. VocoPro KJM-7900 Pro - DJDeals.com. Good price on a good mixer if you go with the computer based option. Monster Cable M DJ-CR-1M pair of 1 meter DJ Cables(RCA to 1/4 inch) - The VocoPro mixer requires this weird cable to go from the mixer to the amp. I found that out after it arrived and had to go all over town to find one. Radio Shack didn't even have it. mycdg.com - When you start buying more karaoke disks, you end up with a lot of duplicates plus there are usually a maximum of three good songs on the disks. mycdg.com has custom karaoke disks at $3 per song. That might sound like a lot but I'll bet you are paying more than that with the songs that you'll actually use with the regular disks. Also check out Amazon.com prices on whole karaoke disks. Make sure you get the CD+G formats and not DVD or you'll get into trouble if you try to expand. CAVS DVD-203G USB - Note: This model has both multiplex and USB and can play the super CD+G or the CD+G or the DVD formats. You need the multiplex to turn off the vocals on most super CD+G's. You need the USB so that you can load your disks on an external hard drive so that you don't go crazy changing disks. Do a Google search of it and find the lowest price (about $250). A four microphone wireless system - See computer supplies above (about $290). Behringer Feedback Suppressor/Parametric EQ FBQ2496 - A must to eliminate feedback if you have a karaoke system. 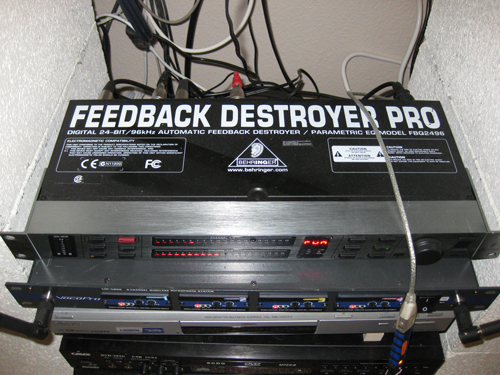 I bought the Behringer Feedback Destroyer Pro DSP1124P Feedback and gave it to a friend and started to buy another when I saw this one. Or DSP110 if you connect directly to microphones. An external hard drive such as Seagate ST302504FDA1E1-RK FreeAgent Desktop 250 GB USB External Hard Drive [CD] (about $90). You'll have to format it for FAT32 to use with the CAVS DVD-203G USB (see page 16 of their manual), which was a real hassle trying to figure out how to do with Microsoft Windows. FAT32 is an old format. They now use NTFS. Microsoft tells you to use the procedure at http://windowshelp.microsoft.com/Windows/en-US/Help/c5545765-da9b-41e4-8fd2-f1f83f9a61401033.mspx#E6B. When you get to their pull down menu, it only offers NTFS. Another site says to run the "format (Drive letter): /FS:FAT32". I couldn't get that to work either. I went to the Seagate web site and it said to download their DiscWizard program. I did but it was still confusing. You need to select "Add New Disc" and at the very end of the wizard it offers the FAT32 option. The Seagate DiscWizard worked for my Maxtor external hard drive also. After that, I ripped the Nutech super CD+G to my external had drive (formatted in the FAT32 format) using CGDFix 3.4e Super and the CAVS 203 USB worked fine with the Seagate external hard drive. If you really want to be cool thought, go with a flash drive The small free one I got with my Dell computer worked without formatting. The average karaoke song in the CD+G format (the CAVS won't read .zip) is less than 5 megabytes. So a 32 gigabyte flash drive (about $250) should hold 6400 songs (32000/5 = 6400). Actual numbers are 3970 songs came to 14.1 GB in the CAVS MCG format and 13.2 GB in the .mp3/.cdg .zip format and 3714 songs came to 17.2 GB in the .mp3/.cdg format. That $105 plus shipping and tax that CAVS wants for a 60 GB hard drive is a rip off. The CAVS player require the CAVS MCG format which can be done with the free CAVS MCGManger or CGDFix 3.4e Super. Computer based systems such as CompuHost and Siglos Karaoke Player/Recorder can use the .mp3/.cdg .zip format. So worst case using the .mp3/.cdg none zipped format a 250 GB external hard drive should hold 53,982 songs (x/250 = 3714/17.2 therefore x = 52982). Doing the same math, a 32 GB flash drive should hold 6906 songs in the .mp3/.cdg format. You'll need to rip the karaoke songs to the external hard drive in the CAVS MCG format or you get audio only, not video. You can either use the free CAVS MCG Manager software of use the CGDFix 3.4e Super. I don't think you can rip the Nutech super CD+G with the MCG Manager software though. The CAVS manual is really confusing about requiring the CAVS MCG format. It seems like that manual spends way to much time covering things that are obvious and no time at all telling you what you need to know. The CAVS 203 USB also needs the English.inx for it's menu. The juke.txt file is useful also. CGDFix 3.4e Super gives you the option of creating the English.inx and juke.txt files when you rip to the CAVS MCG format. If you are using MCGManager, I think you need the INXMenu program. I don't know if CAVS made a mistake or what but the INXMenu programs that's created with the MCGManager program was completely different from the INXMenu program at http://www.cavsusa.com/product/H_player/data/INXMenu.zip. I don't know what the MCGManger INXMenu does the one at http://www.cavsusa.com/product/H_player/data/INXMenu.zip worked great. At first I didn't know about the INXMenu program created by the MCGManager but I'm glad I didn't because it didn't work. The good one at http://www.cavsusa.com/product/H_player/data/INXMenu.zip took me about and hour to find though because it was not on the page that the CAVS manual said. I finally found it via a Google search. When you get it set up, you only need to enter the song number on the CAVS playing instead of going crazy changing disks. For that to work though, you'll need to create a English.inx and Juke.txt file. This is another area that the manual is useless. You'll need the free INXMenu software. The web page that the manual sends you to has nothing about that software. I found it with a Google search at http://www.cavsusa.com/product/H_player/data/INXMenu.zip. Then found out the the CAVS MCGManger software also installs the INXMenu but when I brought up that one it was completely different. I couldn't figure out what it's purpose was. See "Download useful programs" at http://cavsusa.com/product/H_player/dvd203gUSB.htm which has a link to the INXMenu software but the INX Menu that gets installed with the MCGManager is completely different. http://www.sumakaya.com/products/pdf/CAVS_DVD_USB.pdf has the directions but it is pretty self explanatory. CAVS also has a problem with their forum site. I registered under three different email addresses because it keeps refusing my user name and password yet won't let me re-register with that user name because it says it's already used. The CDGFix software will also create the required English.inx and juke.txt files but only if you are ripping the songs. They are working on version 3.5 which may create only the english.inx and juke.txt without the ripping. 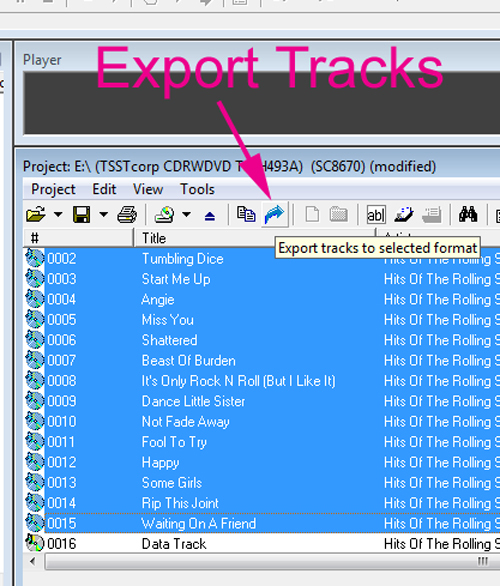 You can bring up the juke.txt file in Microsoft Excel and select "Data - Text to Columns" and follow the menu (type # for "other) and then save it in the .csv format to create song books with programs such as FastTracks V2 Plus software. A note of caution when ripping to the CAVS MCG format; all the files have to have the same number of digits. I believe the MCGManager does this automatically but I used CDGFix and numbered my songs 1.mcg ... 3970.mcg. The problem that I encounter is every time I selected a song from 1 to 999, the CAVS player would lock up. All the songs need to have the same number of digits. I renamed the songs to 00001.mcg to 003970.mcg using CDGFix Super and everything worked fine. Having 5 digits will allow me to expand to 99,999 songs. If you are running out of USB ports, something like CyberPower CPH720P USB Hub, 7-Port, USB 2.0, 480Mbps (about $30). Nutech volume 1,2 and 3 (super CD+G) to get started (about $300) or other bundles pack (CD+G, not DVD or you'll get yourself in trouble when you try to expand) then go with custom karaoke CD+G's at places like mycdg.com to fill in the gaps. Otherwise you end up with a lot of duplicates. SingClean.com has the CAVS DVD-203G USB/Nutech 3 pack bundle for $389. CGDFix 3.4e Super (about $80) is great for copying super CD+G to the CD+G format hard drive. For back disks (optional) you'll need something like Plextor Super Multi Portable CD/DVD RW Drive (about $165)on disks such as Verbatim DVD+R DL 8.5GB 2.4X 20pk Spindle (about $40) and backup software such as CGDFix 3.4e Super (about $80). 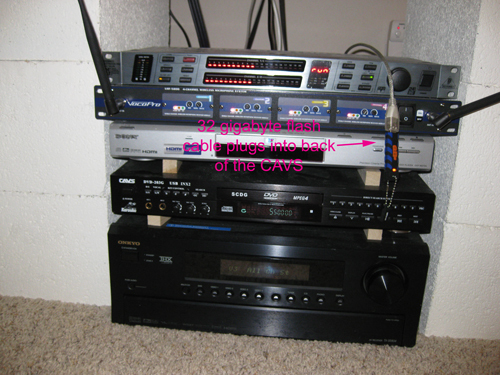 You might want to get a fiber optic cable to go from the CAVS 203 to the receiver or entertainment center. See Tripp Lite Digital Audio Cable (optical) - 6 ft. Skip the player and go with something like CompuHost software (about $180). Siglos Karaoke Player/Recorder (about $50) is a cheaper option and might have a better window because it uses Microsoft Media Center. On top of that, the Siglos Karaoke Player/Recorder has multiplex, which will solve the problem with removing the vocals from the Nutech Super CD+G originated songs. A mixer such as VocoPro KJM-7900 Pro (about $350). A computer to mixer cord such as Monster Cable JM REPC M HP-20 Computer Stereo Audio to Stereo Receiver Using Minijack-to-RCA Connection (20 ft.) along with a splitter such at Cables Unlimited - Audio splitter - mini-phone stereo 3.5 mm (M) - mini-phone stereo 3.5 mm (F) (about $9). A DVI - D splitter such at Cables Unlimited Premium 12-inch DVI-D Cable Splitter (about $18). For an HDTV, something like Cables To Go - 40323 - 5M (16.4ft) Velocity HDMI to DVI Digital Video Cable (about $31). You can also skip the splitter above and plug this in as the second monitor and go into the control panel and switch monitor 2 to the primary monitor when you are using the CompuHost. I found this temperamental though. The way that works 100% is to turn off the computer, unplug both monitors, connect the DVI to HDMI HDTV cable, turn on the HDTV and select HDMI and then start the computer again. If you using a desktop vice a laptop, a wireless keyboard and mouse such as Logitech Cordless Desktop LX 710 Laser (about $60) and possibly a USB extension cable such at Tripp Lite U026-016 USB 2.0 Active Extension Cable (16 ft.) (about $22). An external hard drive such as Seagate ST302504FDA1E1-RK FreeAgent Desktop 250 GB USB External Hard Drive [CD] (about $90) or stick with your computer's hard drive. Nutech volume 1,2 and 3 (super CD+G) to get started (about $370) or other bundles pack (CD+G) then go with custom karaoke CD+G's at places like mycdg.com to fill in the gaps. Otherwise you end up with a lot of duplicates. CGDFix 3.4e Super (about $80) is great for coping super CD+G to the hard drive or backing up super CD+G disks. It will also rip super CD+G and CD+G to the .zip format on you hard drive which can be read by the CompuHost software. If you go with the computer based route, the software reps will tell you that super CD+G will not work because it is a proprietary system and is copyrighted by CAVS. It might be copyrighted but I was able to read it from both of my CD/DVD readers and CGDFix 3.4e Super was able to copy it from there to my hard drive in just about any format including the CD+G/.zip format used by CompuHost. The only problem you run in to is that the disk number shows up as the title. This isn't a problem because you usually go by the song book anyway. You could always enter the title and artist in manually if you want. When you copy from super CD+G to CD+G/.zip on you hard drive, CGDFix 3.4e Super allows you to select the starting number and number of digits. I selected six digits and numbered my disks. That way I can use the same song book for both the computer based and player based routes. The first two digits are the disk number. Siglos Karaoke Player/Recorder (about $50) is a cheaper option and might have a better window because it uses Microsoft Media Center. On top of that, the Siglos Karaoke Player/Recorder has a multiplex button, which will solve the problem with removing the vocals from the Nutech Super CD+G originated songs. VocoPro KJM-7900 Pro mixer (about $350). VocoPro UHF-5800 - Four wireless microphone (about $290). Monster Cable JM REPC M HP-20 Computer Stereo Audio to Stereo Receiver Using Minijack-to-RCA Connection (20 ft.) - Goes from the computer to the mixer. If you are going to use the record feature, you'll need to order two (one going the opposite way from the record output of the mixer to the microphone plug on the computer. Logitech Cordless Desktop LX 710 Laser (about $60) - If your computer is in another room. Cables Unlimited - Audio splitter - mini-phone stereo 3.5 mm (M) - mini-phone stereo 3.5 mm (F) (about $9) - You'll need something like this so you don't need to keep unplugging you monitor speakers and plugging in the mixer. A DVI - D splitter such at Cables Unlimited Premium 12-inch DVI-D Cable Splitter (about $18) - So that you don't need to keep switching the computer monitor/HDTV cable back and forth but I couldn't get mine to work. Cables To Go - 40323 - 5M (16.4ft) Velocity HDMI to DVI Digital Video Cable (about $31) - Goes from the computer monitor plug on the computer to the HDTV. Seagate ST302504FDA1E1-RK FreeAgent Desktop 250 GB USB External Hard Drive [CD] (about $90) - You might need one of these if there isn't enough room on your hard drive. Nutech Party Packs Volume 1, 2 and 3 - If you do the math it only comes to 8 cents per song with very few duplicates ($100/1234)=$0.081. The Siglos Karaoke Player/Recorder will remove the vocals with its multiplex option. You'll also need the CGDFix 3.4e Super software shown below to get the super CD+G to the CD+G zipped format on your hard drive. mycdg.com - To fill in the gaps of the songs that's not included above. FastTracks V2 Plus software - Does a great job of making song books and is required for the CompuHost software for the optional auto naming feature. See my web based song book and a picture of my hard copy printout below. Most computers have one or two DVI plugs. Mine has two and I did some research on it. One of the plugs on the computer is DVI-D (http://www.amazon.com/exec/obidos/ASIN/B0001Y8UC0/qualitycounts - Note: No pins on the right hand side) and one is DVI-I (http://www.amazon.com/exec/obidos/ASIN/B0002GRUHI/qualitycounts - Note: Has pins on the right hand side). Don't try to plug a male DVI-I into a female DVI-D. It wipes out the pins, something I learned the hard way when I tried to plug in a DVI to VGA adapter into the wrong side. I believe a male DVI-D will plug into both a DVI-I and DVI-D. These are the song books I made with FastTracks V2 Plus software. I realize that the covers don't tell anything about the software. The covers were purchased at Office Depot . The comb binder punch for the holes was purchase at Amazon.com. See Plastic Comb Binding Machine at Amazon.com. My song book came to 78 pages, which being double sided came to 39 sheets which required a 1/4" or 5/16" comb. I felt their song disc database was more trouble than what it was worth. I opened the CGDFix 3.4e Super software then inserted the super CD+G or CD+G disc and CDGFix recognizes it. 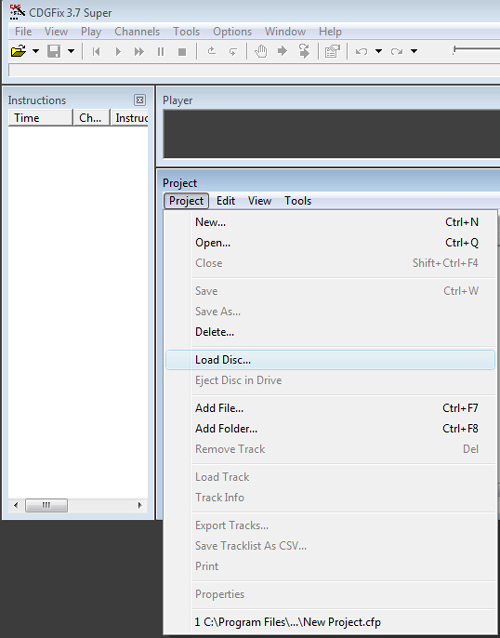 Then I select "Project - Save Tracklist as CSV...". Then I open Microsoft Excel and select "All Files" and open the .csv file. To get the columns, highlight every row and select "Data - Text to Columns - Delimited - Next " and put a check mark in "Tab, Semicolon, Comma, Space and Treat consecutive delimiters as one". You can highlight everything and select "Home - Format - AutoFit Column Width" to make it easier to read. Then I delete the first row and all columns that don't apply and insert a blank top row and label the columns in the order of "Song Title", "Artist", "DiscID", "Track#" (as per the FastTracks manual) but I leave the "Track#" blank and insure the columns are in that order. For "DiscID", I use a 6 digit numbering system where the first two digits are the disc number and the last 4 are the track number so if I ever want to go back to using discs I still have that option. 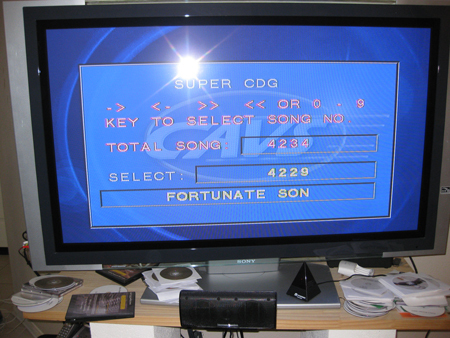 If you have 1234 songs as in the case of super CD+G, you can create a formula to get the "DiscID" (for example "+10000+d1" and copy down the column) then copy that column and paste it back into the same column by selecting "Home - Paste pull down menu - Paste Values". To ensure 6 digits, select "Home - Format - Format Cell.. - Number - Custom" and put in 6 zeros. Close Excel because you can't open the same file with FastTrack while it is open in another program. 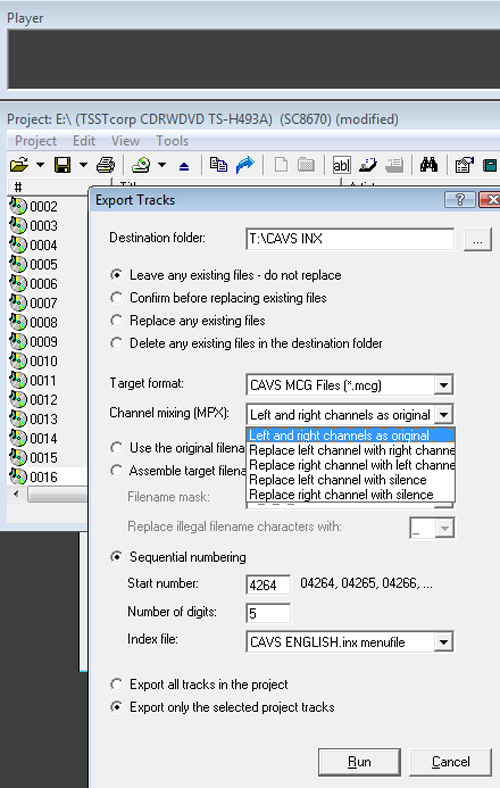 Bring up FastTrack and select "Import CSV file into song book" from the "Documents" directory most likely. FastTracks has a bug in it so you have to go out of FastTracks and back into it to get back in their default directory or else you'll get an error every time you try to do something. With that saved FastTracks file you can print out a neat song book and save it to a web page format. See mine at Song Book. Use Your PC as a PA - PC Magazine - "Find the speaker icon in the system tray. If you don't see a speaker icon, launch Control Panel and double-click the Multimedia, Sounds and Multimedia or Sounds and Audio devices applet. On the first tab find the check box that relates to showing a volume icon on the taskbar - check that box and click OK. Double-click the speaker icon to open the Volume Control window, which acts as amixer board for the various sound channels. In that window, choose Properties from the Options menu. Make sure that Playback is selected in the Adjust volume for box,and that the check box for Microphone is checked in the list of volume controls. Choose OK to close the Properties window ... You should now see a column labeled Microphone in the volume controls. Uncheck the Mute check box for the microphone, making your mic live. Adjust the Microphone and Volume Control settings and the volume control on your speaker system as needed"
Miguel Carrasco's Real World: Vista Microphone and Line-In Issues? - miguelcarrasco.net - "Right-click on the sound icon in the system tray and select Playback Devices (or alternatively, go to Control Panel and select Sounds). Once in the Sounds window, double-click the Speakers options, then go to the Levels tab, and there you'll find the available options"
"If you can't get the input monitor to appear in the speakers/headphones section as a few of you can't. 7) Right-click the little Sigmatel Icon and select "Playback Devices"
8) Click "Speakers/Headphones" and then "Properties". 9) Under the "Levels" tab, there is now a new option called "Input Monitor", which is muted. Click the speaker to unmute to Input Monitor, and the Line-In port now functions as expected (i.e. like every other computer and every other sound card made in the last 20 years)"
There you go, you can now hear your microphone on your speakers. My favorite karaoke software is Siglos Karaoke Player/Recorder (about $50). If you don't know some that can put your karaoke songs onto your hard drive you'll also need software to do that. My favorite is CGDFix Super (about $70).